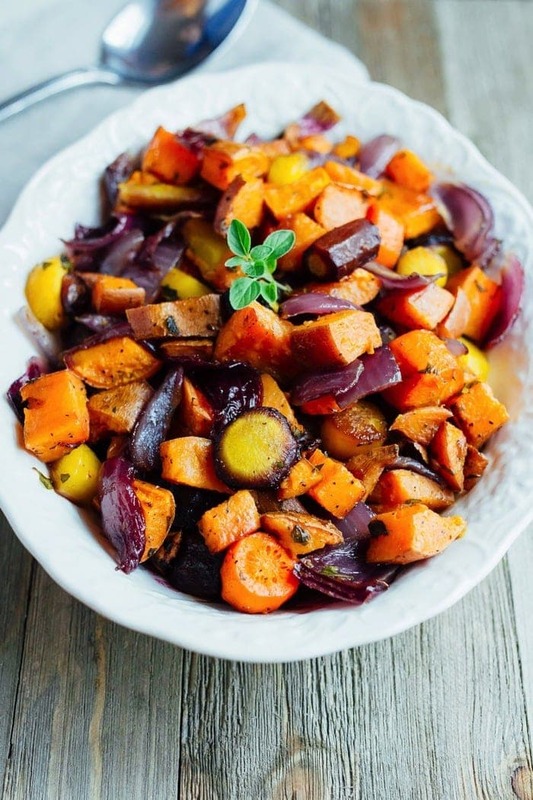 These caramelized roasted root vegetables with sweet potatoes, carrots and parsnips are such easy and healthy side dish. Great for the holidays or everyday meals. I have Thanksgiving on my mind lately and I’m currently planning what dish(es) to make for our Thanksgiving meal with Isaac’s fam this year. 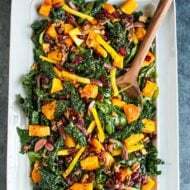 This healthy sweet potato casserole is my usual go-to, but I’ve already made it twice this month for Friendsgivings so I’m leaning toward something different. Maybe my shredded kale and brussels sprouts salad (a total crowd pleaser) or perhaps a big batch of roasted root vegetables. I should probably just make both… that seems like the best idea. And no matter what I know I’m making these creamy pumpkin pie bars for dessert. That’s already been decided. As I mentioned when sharing this root vegetable tagine a couple weeks ago, root vegetables are a great source of complex carbs. They’re packed full of antioxidants, fiber, essential vitamins and minerals. And according to ayurveda, root vegetables have a grounding energetic property so when we eat them we feel balanced, rooted and less spacey. 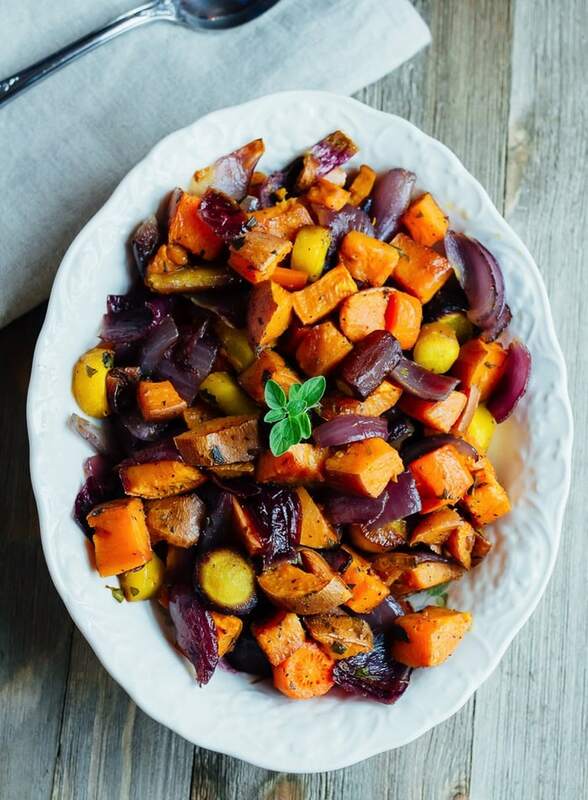 If you feel like you could use a little grounding during the holiday season (don’t we all), load your plate up with root vegetables like onions, sweet potatoes, beets, parsnips, carrots, daikon, turnips, rutabaga, radish and yuca. 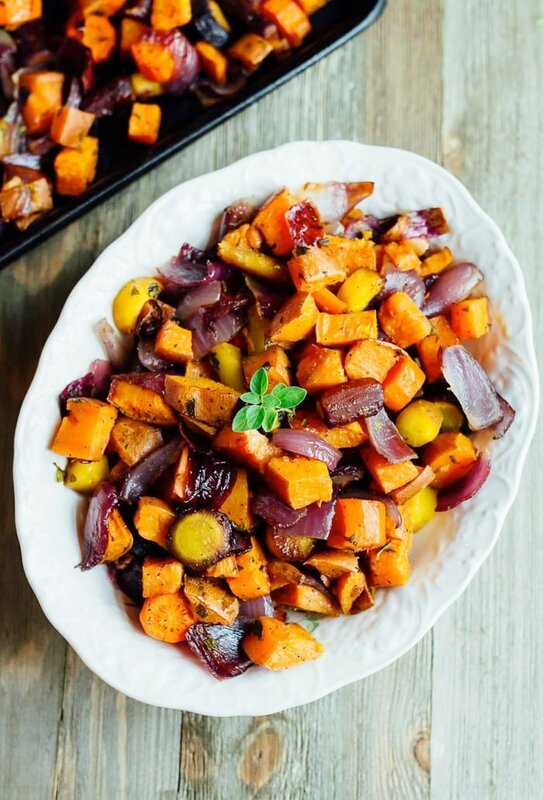 Roasted root vegetables can also cure a craving for sweets. The roasting process caramelizes the natural sugar of the root vegetables so after roasting they taste amazingly sweet and delicious. 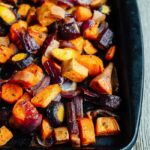 I love making big batches of roasting root vegetables for special occasions or as part of my weekly meal prep. This particular recipe is seasoned very simply with a little oil to coat the veggies, sea salt, pepper and fresh oregano. 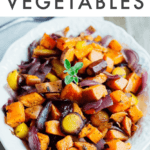 For the veggies, I’m all about using sweet potatoes, carrots, parsnips and red onion to create a beautiful array of colors, but feel free to experiment with your favorite root vegetables. 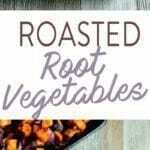 If you make these roasted root vegetables be sure to leave a comment and star rating below. Your feedback means the world to me and is so helpful for other EBF readers who are thinking about making the recipe! Stir the oil and oregano in a large bowl. Add sweet potatoes, carrots (or parsnips) and onion. Toss to coat veggies. Sprinkle vegetables generously with sea salt and pepper and spread on a baking sheet. Make sure the veggies are in one layer so they roast instead of steam. Roast veggies until tender, about 50 minutes. Remove from the oven half-way through cooking to toss veggies. This dish can be made up to 4 hours ahead. Let it stand at room temperature. If desired, rewarm in 350ºF oven for about 15 minutes, or serve at room temperature. Are you doing any cooking for Thanksgiving? If so, what are you making? Roasted veggies are one of my favorite side dishes. I’ll have to try this recipe, I don’t think I’ve ever added oregano to them before. 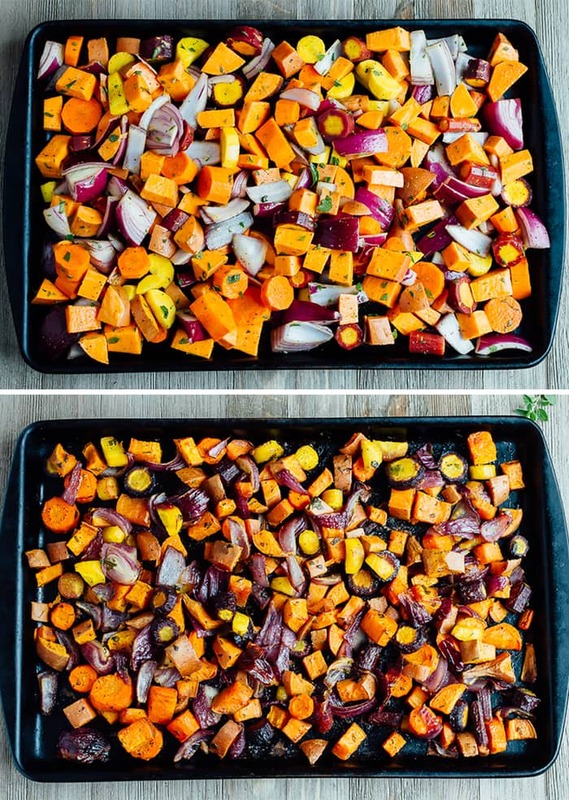 Any combination of roasted vegetables, especially of the root variety, are my go-to! They never disappoint. We have leftover roasted root veg from our wedding that I froze, so all we have to do is reheat and enjoy on Thanksgiving. 🙂 Maybe that will make me doubly grounded given how effortless it will be. hehe Awesome photos, Brittany! These look perfect. Wondering the best way to adjust for a slow cooker if there’s no oven space? 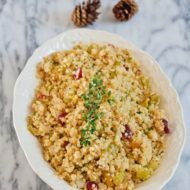 I wonder if I could make this recipe the day before, then warm them up and keep them warm in the slow cooker (to free up oven space on Thanksgiving)? Do you think the veggies would get mushy? Hmmm… I haven’t ever tried this so I’m not sure, but I do think they might be a little mushy after sitting in the slow cooker for a while. Me too!! Love sweet taters. 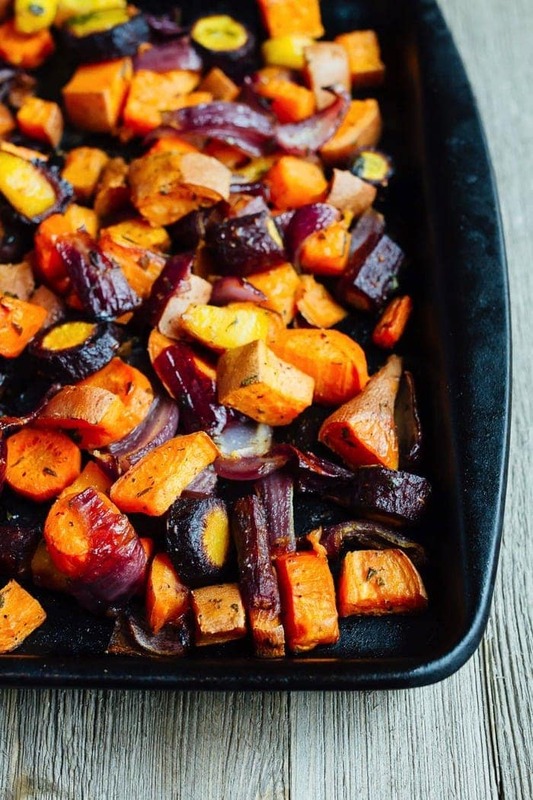 I can’t get enough roasted veggies from October – April. There’s just so much more flavor when your roast. One of my favorites to roast is Brussels sprouts. Those will be on our Thanksgiving table for sure! Hi Brittany, thanks so much for this recipe (& so many others I intend to try!) 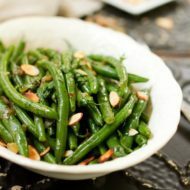 I made this dish for the first time this Thanksgiving and it was a huge hit with everyone from the meat loving men to the vegans to my nearly 2-year-old little boy. I made again with dinner today and it’s definitely becoming a regular in this house! I made this on Saturday and it was so popular even with my kids ages 11-15 that I am making it again 5 days later. Very simple, especially if you have a vegetable chopper. The only thing I did differently was to use chives instead of oregano because it was we had on hand. This was a success dish on Thanksgiving. It was easy but so tasty. It is on my top list of roasted veggies. Thank you very much for sharing! Do you think I could chop and toss them a day ahead, then put them in the oven the next day?